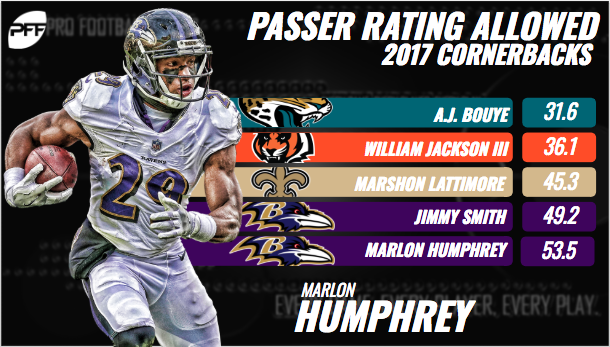 "Hidden within a depth role to start the 2017 season, Baltimore Ravens cornerback Marlon Humphrey played just 34.6 percent (208/601) of the team’s defensive snaps in Weeks 1-9, earning an 81.0 overall grade in said span. The Ravens’ coaching staff then rewarded Humphrey in the form of a starting nod following their bye in Week 10 and the former first-round pick didn’t fail to impress. Playing 80.1 percent (398/492) of Baltimore’s defensive snaps down the stretch, Humphrey tied for 10th in passer rating allowed (46.7) and seventh in catch percentage allowed (45.24) among the 68 NFL cornerbacks with 175-plus coverage snaps played in from Week 11 on. He also finished the season with an 82.7 overall grade, tying for 33rd among qualifiers. In his seven-week stretch to close the season, Humphrey put together a marquee performance against the rival Pittsburgh Steelers, as he limited wide receivers Antonio Brown and Martavis Bryant to just three receptions for six yards on nine total targets en route to an 82.7 overall game grade. Due in large part to his strong finish, Humphrey is expected to reclaim his starting role opposite of veteran Jimmy Smith at outside cornerback, setting the stage for a breakout year in 2018." Much like with our outside pass rush situation. I'm optimistic our impact with inside pass rushing can be greatly improved this year, so long as incompetence and an improper use of talent doesn't reign supreme once again. The disturbing trend of investing early round picks into defensive assets and then either not using them, properly, or at all. Has become an all too frequent blemish for this franchise. Rotation, Rotation, Rotation. Don't want your pass rush to stall in key moments, during drives, at all? Then put into place a priority pass rush rotation that accounts for the specificity of your player's profiles and abilities. The outside rotation has been discussed a lot, but how about inside? ^^^That's the combination I believe we'll lean on to disrupt the pocket and get after QBs from the DI. Losing Urban was a devastating development lost amidst louder ones early last season. It helped reveal and develop the ability present in Willie Henry but left our interior pass rush options, that Pees was willing to play, too thin. If you sub Willie Henry out for Brent Urban you're rotating a skill set to keep it's impact fresh, potent, and most importantly present. If you sub Willie Henry out for Carl Davis, you're just resting Willie Henry. The difference between resting and rotating is key, to rotate a talent it must be present in both parties. According to PFF (Their grading system can be scrutinized but they're useful as activity trackers), Carl Davis had 142 pass rush snaps. That's 142 times where someone essentially incapable of disrupting the passing game, had the chance to. Brandon Williams and Michael Pierce had 269 and 294 pass rush snaps respectively. Both offer vastly superior disruption to Carl Davis, but again those figures are far from ideal as both cannot claim an ability to disrupt/penetrate a pass protecting OL as a true strength. We resigned Urban for a reason. Can you think of another time where that sort of play against the Bengals could've come in handy? 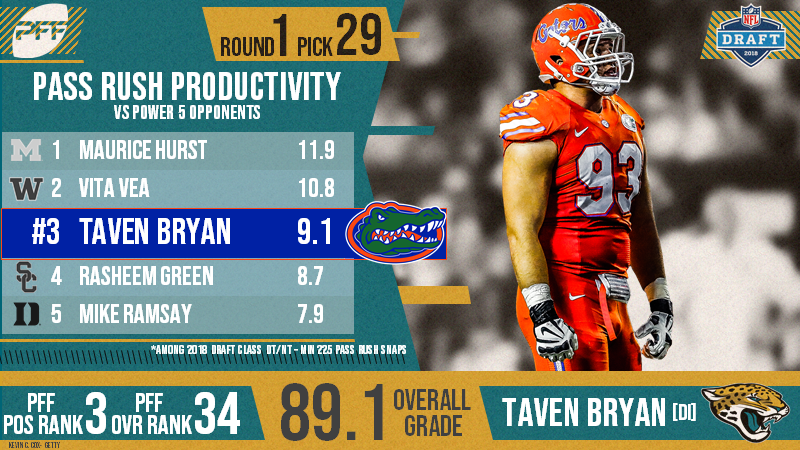 The center piece of our interior pass rush last year, is also expected to bring impact. Willie Henry is a fandom wide breakout candidate for this season, he just turned 24 and is coming off a strong 1st year contributing. Quickly growing as a defender against both the pass and run, equipped with a plus motor and a violence streak. Henry is a player no one can sleep on, and for good reason. By Week 12 of last season Willie Henry had knocked the quarterback down, either by a sack or a QB hit, on 56.3 percent of his pass-rushes, the highest mark of any 3-4 defensive end in the NFL. He put down 22 pressures on the year along with 3.5 sacks and 33 tackles, very impressive totals for a 1st year player thrust into a center role with no running mate. Now onto the 3rd player and our 3rd round pick from last year, who we all hope is this year's Willie Henry, Chris Wormley. Last season Wormley totaled 120 snaps, 37 of which were pass rush snaps. Much like with Tyus Bowser, Tim Williams, and I'm sure Marlon Humphrey if Jimmy Smith hadn't been injured, Dean Pees decided that an early round pick had nothing to contribute. Which like most Dean Pees decisions and thoughts, tends to be flat out wrong or detrimental to the team in some way. Let's take a look. Two years ago Chris Wormley was rated as the most productive DI in college football. Michigan stacked on the DL, then moved him to base end to get the most talent on the field. Still even though outside his ideal position, he ranked 30th in pass rush productivity. Let's put those metrics into context. 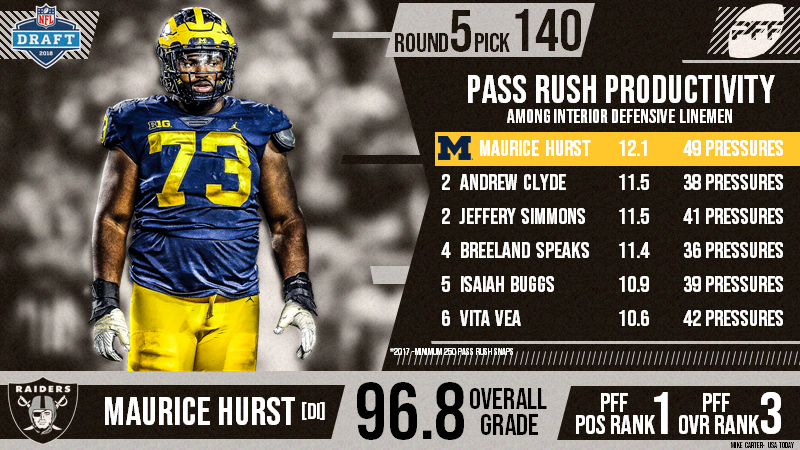 According to PFF, Hurst their 3rd ranked overall prospect in the draft had the highest PPR among defensive tackles entering the draft every year of the last three years. I'd put a million on Aaron Donald being the reason it isn't at least 4 years, and obviously had Wormley entered the draft still classified as a DT in 2016 he would've bested Hurst. Amazing right, and we got him at pick 74. So why? Why didn't he go top end like other productive pass rushing DIs such as Buckner, Donald, Allen, Hurst(if not for his heart condition), or even Taven Bryan? Did he test poorly? Chris Wormley has a monstrous athletic profile that topped last years Defensive Lineman class, and put him in rarefied air among his NFL peers. Off field concerns? Nope, Wormley was heralded as an insanely high character player with a stellar work ethic and leadership ability, by EVERYONE around him. It was a combination of things that caused Wormley to drop. First, the position switch in his final season. For the benefit of the team he played out of position, often at 7 tech instead of his natural 5 or 3. His play at the new position while still impressive, was down enough to knock some shine off of him in the eyes of scouts. Second, he was an over aged prospect. 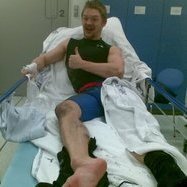 Turning 24 during your rookie season is never ideal, but it could be worse, as we all know. Both of those things caused a slight drop in Wormley's stock, though he maintained some late 1st round buzz up until draft night. Now does all of this mean we got some insane mega steal, hidden gem dragon phenom? Uh,....no. It just means we got a good prospect in an interesting possibly advantageous fashion. Truthfully until I really started doing my getting ready for the new season digging, I was kind of writing him off. Just because it was annoying to ponder another no show DL pick, and I had never scouted Wormley extensively during last years draft. Free of the Pees Haze though, many things have become clear. The Haze doesn't just cause impatience. The Dean Pees Haze can cause surface and even deep level fans of the team to question almost every recent era pick on defense. How many people believe Tim Williams and Tyus Bowser are busts already? How many dummies out there still subscribe to the "If they were good enough to play, coach would've noticed" mantra. "They must not have flashed in practice" nonsense? I bet the number would be staggering. Luckily though, none of that matters. Magic right? Tim Williams beating Joe Thomas for the 1st QB hit of his career to end the game. Our go to Tim Williams gif around here. Based on all the evidence besides this play, we still had no reason to believe he was incapable of contributing to the team last season, which makes the fact that this play happened and still he wasn't utilized all the more infuriating. How about Chris Wormley? Even with no real play evidence, we can draw the conclusion that based on his proven college skill set, athletic testing, mentality, and our own lack of interior pass rush. He, like Bowser and Williams, logically should've been given more of an opportunity to contribute to a vital aspect of our team. What if we had more than that though, what if we had demonstrated value such as the Williams gif above? Well we do. Against the Bears with B. Williams and Davis injured, Wormley saw 54 snaps his highest of the year and almost half his season total. He had 11 *considered pass rush snaps, here are the highlights. Base 43 look, Wormley(Left Edge) bulls Massie back towards Trubisky. Judon's horrible coverage at SAM gives up a layup 1st down pass to Dion Sims. Embarrassing. (Wormley was first off the line and showed great power). Again Wormley at Left Edge, the D is running contain pass rush. He push locks and controls Massie until Trubisky breaks the pocket. Wormley heads him off while chasing Mitch down and forces the throw away. I hate contain game plans which Pees ran a ton of against the Bears. They tell you very little about player's true pass rush potential, but I included this one to show Wormley's savvy work and closing speed. First true inside pass rush snap for Chris Wormley and he blows up Kyle Long with a $ outside fake. Gets after Trubisky with quick pressure, but of course Tony Jefferson blew his assignment and the Bears get an easy TD. This is Wormley's "Joe Thomas" play, proof of his value and potential impact. Getting up field and getting after the QB, it's a shame the TD overshadowed his play here. Another contain rush but I included it because of a botched snap. Wormley's quick identification and pursuit put him an inch away from his first career sack and safety all at once. Almost came up with the game changing play we needed. 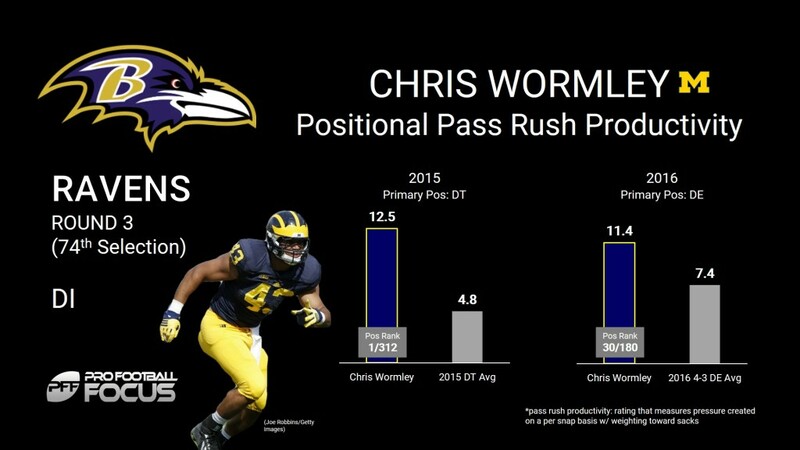 That's why I think Wormley will be the 3rd man in our interior pass rush rotation, and I'm excited to see him get the opportunity. ZDS will be interesting to watch in his contract year, but I'm predicting a somewhat reduced role for him. I think we'll see more interior pass rush work from actual DL this year and he'll be held back. Zach Sieler is an intriguing unknown. You just never know how these DII guys are going to show, but we have a decent history with them and he certainly profiles as an interior rusher. Pre Season will be huge for him. Yes, I want to see Wormley out there too. 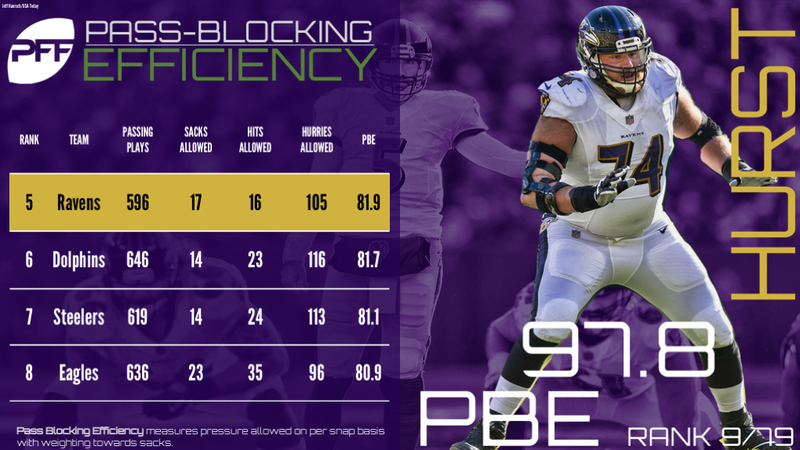 The Ravens taking him last year was kind of frowned upon given their depth along the defensive line then (and now) but he was a true value pick. Dude is good. Really good. A shame Pees couldn't find a way to actually have a rotation along the defensive line. Chris is/was a guy that could contribute immediately and be a quality pick despite his age as a prospect. Hopefully Martindale has a brain. Same sort of thing happened with Willie Henry. And hey, they even both went to Michigan. Which is a big negative in my eyes... But even I was happy with Baltimore ending up with those guys in the 4th and 3rd rounds. Just get them on the field. Don't have a lot of hope for Kaufusi though. Allen #4 & Collins #5. Not bad. Our Ghost King. Just because people don't know who he is, it doesn't mean the crown isn't his. its his until he decides to hang 'em up. Ravens truly were blessed with generational players on several positions over the years. Yanda was a 3rd round pick ffs. Tim Williams truthers alive and well. To be honest I can't find it within myself to bang on the Pees is awful drum any longer. Just glad he's gone. The best thing Martindale could have learned from Dean is what not to do. Simple as that. I have a hard time believing pro football focus in general, and this doesn’t help. Our oline had huge difficulties the first half of the season, although steadily improving throughout the season. Still, a ranking as the 5th best oline when it comes to pass blocking is pushing it, as the 5 guys unit gave up a lot more pressures than indicated. Another aspect is how often we had other blockers helping either blocking or chipping, which meant we often had only 1-2 guys running actual routes down the field. Ofc the oline will have a better rating, if pro football focus doesn’t take 2 blocking tight ends and a pass blocking full back into account. 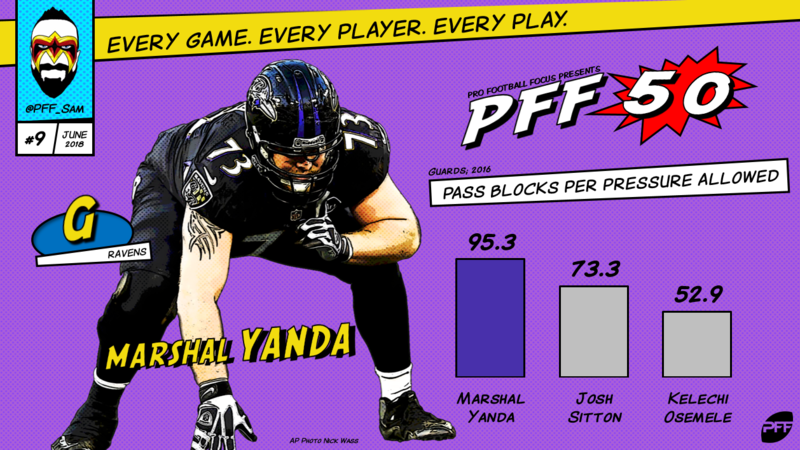 PFF is good at tracking stats, like pressures, targets, etc. When they enter into rankings like that though, without factoring in some of the variables you mentioned and others, it's all just meaningless. They've never been good with OL. Sure their system will show how dominant Yanda is because his greatness is impossible to miss by any metric, but then they'll have someone like Zuttah highly ranked and you want to savage them. That's where a guy like Ken McKusick from RSR comes in handy, as he tracks the Raven's line over every single game and acknowledges all the drops, chips, etc. None of the players on our line were a liability once the lineup settled, and pass protection was never a big concern from any spot but 5 does seem too high. I'm anxious to see how the line settles for this year. Even with their experience at the position I don't think Skura and Bozeman are going to be able to stop Lewis or Siragusa from taking the starting center spot. Physically they're just so out matched, it's hard to see them impressing against the likes of Pierce and Williams. Also, Hurst was given borderline starting money, not starter money. So don't be shocked if Roman and D'Alessandris think a combination of Siragusa, Lewis, and Yanda is our best option. I still want to see Lewis staying healthy before I see him as a starter. I might be too high on Bozeman, but I think he is a great candidate for a starting job at center. I think we also saw a lot of balls get out quicker than normal, often to a spot where it was either going to be a short catch or incompletion, whether that was Flacco doing it because he didn't trust his line or by design (or a combination of the two). There were certainly some good players along the line last year (Jensen, for example), but the early injuries threw off the cohesion of the unit.